#growgrahamgrow – Page 3 – A disease may be rare but hope should not be. When the doctors at Children’s Healthcare of Atlanta started to discuss the possibility that Graham’s seizures and brain atrophy were caused by a mitochondrial disease, we were scared. We didn’t know much about mito, but from what we heard, the prognosis was grim. As more symptoms appeared and with a simple blood test, it was confirmed that Graham had Alpers’ disease, an incurable and deadly mito disorder. During this process, Brandon and I turned everything over to God. We consistently prayed and through His word, He spoke to us. “Everything that was written in the past was written to teach us. The Scriptures give us patience and encouragement so that we can have hope.” Romans 15:4 Hope is an incredible word. It turns darkness into light. It turns the impossible into possibilities. Graham’s disease is hopeless. It is incurable. But if you turn to the scriptures, if you have faith, this can change. When I discuss Graham’s illness with others, the first question people ask is, “What is mitochondria?” I became accustomed to answering this question, along with a short explanation of Graham’s disease, and the importance of mitochondria to make sense of it all. When I returned to work, I decided it would be best to talk with my students about Graham and our experience. I teach high school students and they have been invested in Graham and his story since day one. I knew this would be a sensitive topic, but it would also be a teachable moment to share with them about life, sadness, joy, grief, and more importantly – an opportunity to educate them about rare diseases like mitochondrial disorders. I planned to start the conversation by asking them if they knew anything about mitochondria and I expected them respond to my question with, “Mito…what?” But they surprised me by actually answering my question and they even taught me about mitochondria. They told me that mitochondria are found in almost every cell of the body. They also knew that mitochondria are the “powerhouse of the cell”, which is also true. And they knew that mitochondria is essential to sustain life. I was amazed and encouraged by what they already knew! I also doubted my own intelligence because when the doctors explained mitochondria to me at the hospital, I felt like I was learning a foreign language, which I shared with my students and we had a good laugh. In all seriousness though, I started to wonder what happened. Why did I forget a term that one student described as “basic biology”? I think I forgot about it, along with everyone else who asks me about it, because it didn’t mean much to us at the time. Mitochondria was another term highlighted in our textbook, another definition we memorized and purged after a test – unless you loved science and wanted to study biology in college, you are the exception. But that wasn’t me and I forgot all about mitochondria. At the time it didn’t mean much to me, but now it does. Now, I will never forget it. Graham taught me that mitochondria isn’t just a term from a textbook, it impacts us every day. Graham’s mitochondrial disease is called Alpers-Huttenlocher syndrome. This particular disorder is caused by genetic mutations in the POLG gene. The POLG gene is super important because it provides instructions to your cells to produce new DNA. Basically, it is the brains of your mitochondria. Each mitochondria contains a small amount of DNA for normal functions, and then it will replicate and create more cells. This is essential in creating energy. Well this disorder – Alpers’ disease – caused Graham’s mitochondria DNA to deplete, instead of replicate. And since his mitochondria could not duplicate, Graham’s body was essentially running out of energy. People often ask us if we had any idea he was sick, but we did not. We were blindsided by the onset of his disease. Like most mitochondrial diseases, Alpers’ is difficult to diagnose because symptoms are similar to other disorders. In Graham’s case, he had low muscle tone and GI issues, which are symptoms of Alpers’ disease, but these are also common in preemies, and since Graham was born at 24 weeks, we assumed it was related to his prematurity. When he started to have seizures, another symptom of Alpers’, doctors investigated epilepsy and neurological disorders, not mitochondrial disease because his symptoms did not scream mitochondrial disease. And this is very common for those with a mitochondrial disease. As I learn more about this disease, I realize how important is to educate others. With awareness and understanding, I hope mito disease is a term people recognize like cancer, heart disease, or diabetes. I hope it becomes easier for doctors to identify and treat. But in the meantime, I would simply encourage us to prevent it through genetic screening. Mitochondrial diseases like Alpers’ are inherited. Graham received a defected POLG gene from Brandon and a different defected POLG gene from me. We are both carriers. The chance of us having another child with Alpers’ is 25%. What people do not realize is that everyone is a carrier for genetic disorders. Statistically, most individuals are carriers of 3 to 4 diseases. The odds of you and your partner carrying the same genetic disease is rare, but it is possible, as we have witnessed with Graham and other couples I have met along the way. There are tests available to screen for some of these diseases which I would encourage everyone to do! Tell your friends, your children, even your grandchildren about this option. I think if more couples knew how easy it was to get screened, they would do it to prevent any heartache like we experienced. Most often it is covered by insurance, and if isn’t covered, it is rather affordable. We negotiated our price with GeneVu who I highly recommend. And if you decide to get tested and find out that you and your partner are carriers of the same rare disease, it isn’t the end of the world. Believe it or not, there are other options like adoption or choosing IVF to screen embryos prior to implantation. It is incredible what possibilities exist! We love Graham and will forever cherish our memories together, but if I can spare one family the heartbreak of losing a child to an incurable, genetic disease, I would. Revelation 21:4, “He will wipe every tear from their eyes, and there will be no more death or sorrow or crying or pain. All these things are gone forever.” God promises a better world for us, and I know Graham is there waiting to see us again. In the meantime, we will continue on our journey, sharing our story with others. This is our experience with a rare disease and I hope my voice can lead to more conversations and greater awareness. This is our hope. Author growgrahamgrowPosted on June 15, 2017 June 15, 2017 9 Comments on Mito What? Have you ever felt exhausted or stressed from trying to make sure everything is just right? I know I have been guilty of this. There have been many times where I would try to control a situation and fix it all by myself. Sometimes, I could get by and make it work, but I often felt anxious throughout the process and drained afterwards. However, since Graham’s illness, I find myself releasing that control. It’s definitely not easy, but I try my best to just trust God and let Him do His job. When Graham was hospitalized I asked the doctors countless questions. I meticulously watched the nurses as they cared for Graham so I could learn what I needed to do. I spent hours researching Graham’s symptoms, ways to care for a child with special needs, exercises to help with Graham’s physical therapy, etc. I was tired and I wasn’t finding an answer “to fix” Graham. It wasn’t something I could do on my own. At that moment, as I released my control, I finally found peace within. When I let go of the desire to be in charge, I let God in. And with that I was finally okay not knowing what would happen next. I was okay not understanding why this was happening. Instead I knew that I needed to let God do His job and take care of everything else. And I did my job – obeying Him & being Graham’s mom. With this realization, I finally was able to just sit with Graham and snuggle. I finally smiled as I would sing Snuggle Puppy to him and every day we took silly selfies using every filter on Snapchat. But more importantly, I finally found contentment as I held Graham and prayed. Now don’t get me wrong, I still asked questions and did everything that a mom could do for her son, but instead of relying on myself, and only myself to help Graham, I realized God was in charge, and I was just his Earthly helper. Psalm 37:5 states, “Commit your way to the LORD; trust in Him, and He will act.” It is so simple! If you commit to the Lord, and really trust Him, He will take charge – not you! When my controlling nature tries to interfere, I try my best to release that urge and instead pray. If I commit to Him, He will show me the way. Knowing He’s in charge instead of me, is such a relief! I find comfort knowing I am not alone, and that my problems are in His hands. Since Graham’s passing, so many people ask us how are we doing. I know every day is different, but truthfully we are okay. And I think we are okay because my husband and I live this verse. We have turned our lives over to Him, trusting Him, and we believe He will act for us. To me, this simple verse, and living it by releasing control has been our secret to finding peace within. It is difficult to let go, but I think you’ll find it gets easier and you’ll be happier when you let Him in. When life doesn’t look like how you pictured it, or when things aren’t going your way, it’s easy to complain, or even turn against God for not helping you. It is so much easier to focus on what’s going wrong in your life, and blame others for our troubles. But what if we didn’t? What if we looked for His greatness in the midst of suffering? When Brandon & I pictured a family together, this is not what we envisioned. During my pregnancy, we dreamed about Graham playing little league, building sandcastles on family beach trips, and road trips galore! We beamed thinking about the milestones he would reach, planning his future and his success. But those visions for Graham do not exist anymore & our family picture will never be the same. Since Graham’s passing, many people ask if we want more children. The answer is always a quick yes. 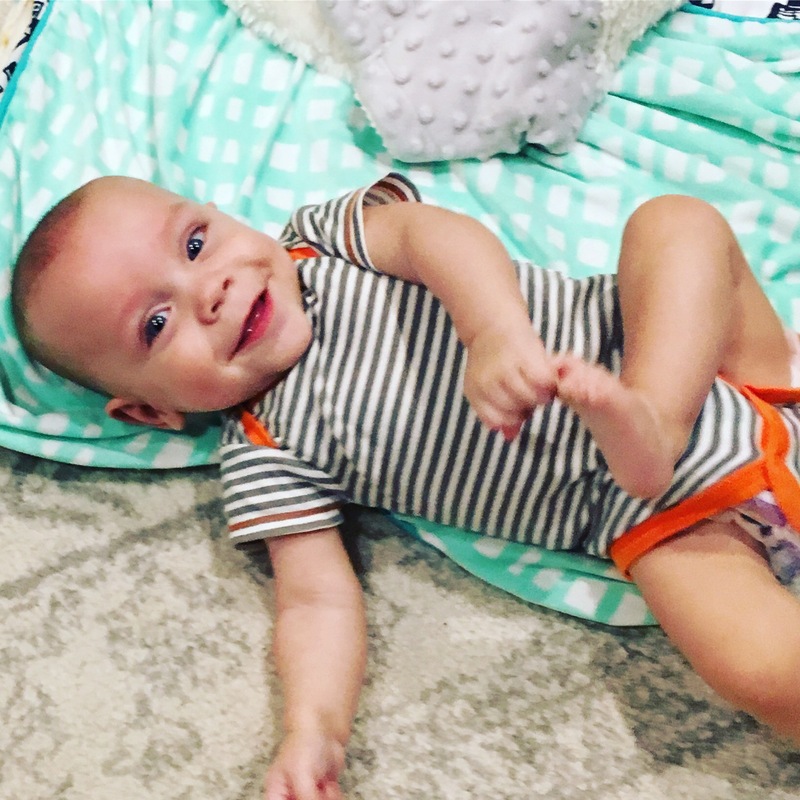 We know another child will never replace Graham or fill this hole in our hearts, but when you watch a piece of yourself grow into this beautiful child who laughs, smiles, and is just picture perfect, you want more. It’s like a drug. And we want our parent “fix” again. When the doctors presented Graham’s diagnosis and explained how his disease was inherited from us, we immediately asked how will this impact future children. We learned that if we choose to have a child naturally, that child faces a 25% chance of having Alpers’ disease. 25% does not seem too high, but after watching the symptoms of this disease manifest in Graham, we know it’s not worth the risk, especially since there is no cure for Alpers’ disease. We were given a few other options, from adoption to IVF-PGD, and we explored the possibilities in depth, analyzing what will be best for our family. Whatever we decide, it will be very different from our first daydream of raising a family together. Again, it’s easy to dwell on how unfair this, or how unnatural this may be, or how expensive it is. But at the end of the day, I think it is wonderful that we have options. I think it is amazing how far science and technology have advanced, giving us an opportunity to have future children who are genetically our own but healthy. Whatever ends up happening, we will be grateful for this new possibility. Life isn’t always full of butterflies and rainbows. Complaints, frustrations, and heartaches are always present. But these obstacles do not define me, or you. And I will not let them cloud the beautiful life God is creating for me, nor should you. “For our light and momentary troubles are achieving for us an eternal glory that far outweighs them all.” (II Corinthians 4:17). As we encounter troubles, remember they are fleeting. They are trivial compared to God’s plan for you. They are minor compared to God’s promises for you. As your perspective shifts, you will notice that “picture” you originally envisioned isn’t nearly as beautiful as the one that He is creating for you. Four months ago, on January 24, 2017 our son Graham entered his forever home. Graham was diagnosed with an incurable rare disease – Alpers-Huttenlocher syndrome and the prognosis is poor. The disease caused Graham to have uncontrollable seizures, brain atrophy, and liver impairment which caused his liver to fail. Alpers’ disease is caused by an underlying mitochondrial metabolic defect of POLG. Prior to his diagnosis, we were naive to mitochondrial disease, epilepsy, and other rare diseases. Now, these terms are a part of our permanent vocabulary and our lives are forever changed. After four months, our hearts are still broken, but we are healing. I will always be Graham’s mom and he will always be a part of our family. This is why our life will never be like it once was, but we will find a new normal for us. We know that whatever this new normal looks like, Graham will always be a part of it, just in a different way than we originally planned. When thinking about God’s plans for us, I know God chose us to be Graham’s parents. He gave us the most perfect son, who was also very, very sick. God chose us to care for Graham and to love on him. And when Graham became sick, and it became clear that God’s plans differed from our vision, we had a choice. Do we blame God and turn against Him? Do we doubt God’s plan for us and ask, “Why?” Or do we praise Him and trust Him? Do we pray and ask for Him to show us a meaningful purpose to His plan? Every day we face this choice. And every day is different. There are days when we feel God’s presence with us and know everything will be okay. But then there are days filled with tears and questions. On those days, it is a difficult to remind ourselves that God is good when the unthinkable happened to us. It is a struggle to see His goodness because we are flawed. Our human flesh is weak and it can prevent us from accepting God’s plans. On those days, I remind myself of God’s grace. “Every good thing given and every perfect gift is from above, coming down from the Father of lights, with whom there is no variation or shifting shadow.” (James 1:17) God gave us the most perfect gift – Graham. And even though our time on earth with him was short, we will be reunited one day. And God will continue to shower us with gifts of His love. His love for us is everlasting and it will strengthen us when we need it. When Graham was hospitalized I started a Caring Bridge page to communicate with family and friends about Graham’s condition. When Graham passed away, I stopped writing. Since my last post on Caring Bridge, many people have asked me to continue writing posts. I never envisioned I would create a blog, or share my story so publicly, but it’s been on my heart these last few weeks. I do not know what God’s plan is with this “blog” but once again, who am I to question Him? I will continue to trust Him to lead us on our journey. I must warn you, I am not a writer, and I am definitely not a expert on anything, but this is my attempt to keep Graham’s memory alive and to provide hope for others who need it most. I envision this blog as an outlet to share our grief, but also our hope for a brighter future. I see it as an opportunity to raise awareness about rare diseases, but also as a way to keep Graham’s spirit with us every day. As his mother and his #1 fan, I want Graham’s memory to grow & impact as many people as possible, hence our title #growgrahamgrow.